From a 1972 international tournament. 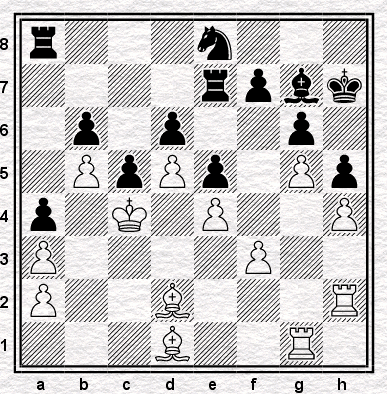 The last move played before the diagram position was 28....Nc7-e8. What was the next move played? We've had some of Justin's (IV, III, II, I) and one of Tom's, so it's about time I had a think about a few of my favourite moves. There's something rather appealing about Black responding to this with ... Qa5 - simply allowing White to take a piece and threaten mate in one at the same time. which reaches the position I was thinking about at the weekend - so well done to Richard and Justin for guessing the opening correctly. I wonder if I'll ever get to test their assessment that Black is OK.
A new pedagogical series in which we will look at a portion of a game from the previous weekend in which I miss some obvious tactic or other. Readers will be invited to practice their skill by seeing if they can spot what I missed. and then proceeded 12.O-O Ne5 13.Qd2 Ng6 14.Bxf6 Qxf6 15.Nd5 Qd8 16.Kh1 Be6 17.Ra3?! Ne5 18.Qb4? Ng4 and Black won swiftly. 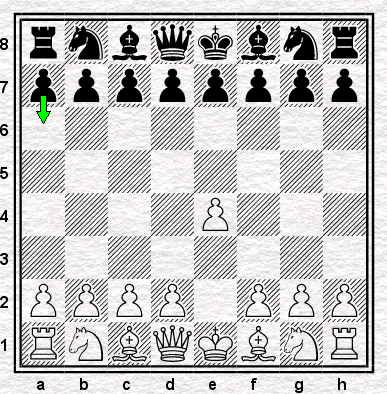 However, somewhere in the sequence between the diagram and move 16 Black missed a simple and thematic tactic. Can you see what I did not? I've been doing a bit of opening preparation of late - and in one line I managed to reach the position above. It's pretty wild and, I have to confess, totally beyond my understanding so I thought I'd throw it out to the blog readership. How would you assess this position? How is play likely to proceed? 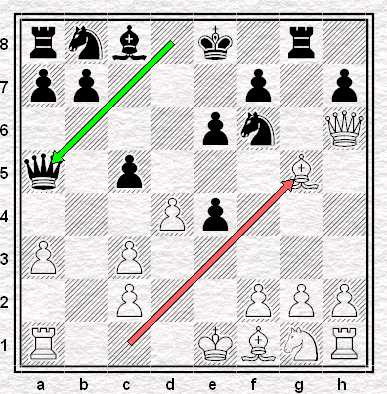 (b) how many moves are we from the start position? The other day I got an email newsletter from the Internet Chess Club which, among other things, gave us the latest results from the United States Chess League, of which I'd not previously been aware. In the course of doing so it listed the names of the teams, which were some distance, in more senses than one, from the Ponders End or East Grinstead IV that some of us are used to. To tell the truth, one or two of these aren't exactly to my taste. Boston Blitz is fine, although I hold the same opinion about blitz as did Botvinnik's: San Francisco Mechanics I like, the name coming from the Mechanics' Institute in that city. But Seattle Sluggers? Philadelphia Inventors? The second of these is more than a bit clunky and the first of them is asking for trouble. Does it refer to how they play or how they behave in the bar afterwards? Do they live up to either description? As for Miami Sharks, personally I wouldn't believe a word they tell you. I don't much go for this sort of thing: I wonder if it's not another example of trying to give chess a new image, but one that nobody will actually believe. Yes, chess can be exciting and we should say so: no, it's not normally exciting and if we claim it is we'll just look like we're desperate. I never much liked it when Superleague started and a number of time-hallowed and original rugby league club names gave way to names that were flashier, more exciting and fundamentally more stupid. Bradford Northern became Bradford Bulls and Wakefield Trinity became Wakefield Trinity Wildcats, the latter trying to have it both ways and hence having it neither. Then I discovered that they'd renamed all the cricket teams for one-day games so that I found myself supporting Middlesex Crusaders against Kent Spitfires. What do we do? KILL! This might have been more intimidating had the game not been taking place in a public park. Or indeed had the Bulldogs not been trailing by forty points to nil. That's the thing, you see: get yourself a ridiculous nickname and you end up looking ridiculous. Leeds Rhinos - how many rhinos are there in Leeds, anyway? Can they be seen on Ilkley Moor? Carolina Cobras? What's the point? 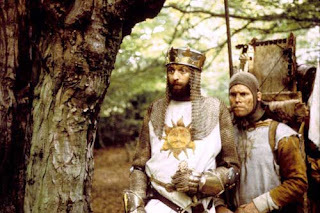 The London League does feature Drunken Knights which has the merit of probably not being a name that would be selected by one's image consultants, were such people to be consulted. Wad Green is an amusing nickname, for reasons London players will understand, but it is not one the team themselves are likely to select. But Hackney Hackers has a ring to it, even if it's not the ring of truth. What should we call ourselves? What has the ring of truth? Streatham and Brixton Blunders would be appropriate, I think. Who are we? Streatham and Brixton Blunders! What do we do? 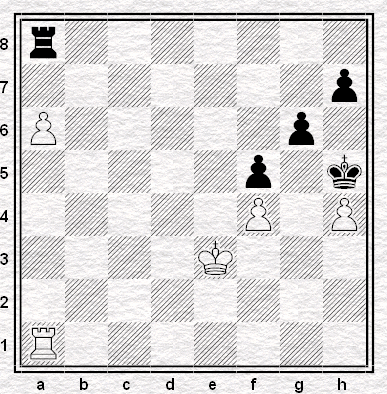 The previous two in our series dealt with moves uniquely allowing mates in one. Vulgar, by comparison with today's effort. It's from Lone Pine 1978, Jonathan Mestel against Walter Browne: the position shown occurred after White's forty-seventh move. Despite the reduced material and his habitual struggle against the clock, Browne, to his credit, found in this drawn position an elegant way to lose - and the swiftest. Here's an advanced date for your diary: 16th-17th February 2008. The place, Brentwood in Essex - up to only 35 minutes on the train from central London. The occasion? The Second Brentwood International Chess Tournament. And what's so good about the tournament? Well, the prizes are actually serious money for once. £1000 for first place in the Open; £400 first prizes in both the Under 170 Major & the Under 110 Minor. Plus generous second and third place prizes, and several grading prizes too. And if last year is anything to go by, there'll be some seriously challening opposition too. Last year's tournament featured 231 competitors, the Open won by Grandmaster Nicholas Pert in a field that boasted three Grandmasters and five International Masters. So, do you think you'll make it? Here's something that's puzzed me for maybe thirty years or more. 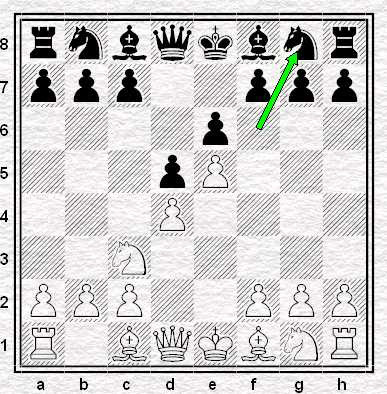 It's a short passage from Bobby Fischer's My Sixty Memorable Games, relating to the position shown below. That does it! Once this Bishop is gone, White has a field day. "Why didn't White play 28. N-Q2. . . ? So far as I can see Black can then resign. Or am I missing something?" (A.R.B. Thomas in a letter to Chess) Right, Mr Thomas! What did Fischer mean by Right, Mr Thomas? Did he mean "you are correct, Mr Thomas, it's a winning move"? (It is, of course.) If so, why did he append an exclamation mark to the move he did play, which while it also wins, does so more slowly? Did he mean "right, Mr Thomas, you are indeed missing something"? If so, what did he have in mind? Did he mean that Mr Thomas was missing something, but that it wasn't something on the board - that he (Fischer) had a reason for playing the way he did and that Thomas missed it? This puzzled me a lot as a kid, when I read Fischer's great book incessantly. A generation before computers, I satisfied myself many times that the knight move won immediately - as I'm sure Thomas, a generation earlier still, must have done before writing. So I wondered, if I had understood the chess, if I had not misunderstood the English, and I pored over it to see if there was some hidden message there, some joke, or something so obvious it was too obvious for me to see. But I never found it. So still, all these years on, I do not understand what he meant. Fischer seems confident in his meaning - Right, Mr Thomas! with an exclamation mark. But what? And why the exclamation mark after 28. RxB? As for what it is - look carefully. Yellow is for knight, blue is for bishop, red for rook. I've never seen a graphic quite like it with which to demonstrate the importance of the centre, or paracetamol. If this doesn't do something for your board vision, then I don't know what will! ... The "chess image" is introduced in the beginning of Krogius' book on chess psychology, which I am working my way through. I figured that once a guy can work with the chess images, then he'll be in good shape. Interested? Tom adds "Let me know if you get any ideas on things to make images for. I am always looking for new ideas." How about the same thing, but in pastels? 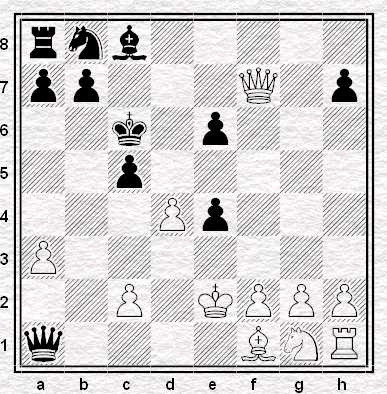 with 20...h5 Black started an interesting counter-attack and with 26...Re3 he obtained the advantage. Reading this, the first thing that occurred to my perhaps over-pedantic mind was: how could Black have obtained the advantage? If after his 26th move he had the advantage, surely he had it before his 26th move as well? Isn't the nature of an advantage that it is inherent in a position? That provided moves are available to you which subsequent to their execution will give you a better position than your opponent, you already possess the advantage? This being so, surely an advantage can only be provided by an opponent's error rather than by our moves as such, however good they may be? Provided we neglect the question of whether there is an advantage to either side in the opening position, which is in any case irrelevant to Eingorn's point (or Alekhine's, as paraphrased by Eingorn) I'd suggest that it is. Black must already have possessed the advantage before he moved. You cannot create your own advantage. It would appear that Hewlett Packard consider Jay Z to be the "CEO of Hip Hop" (I hadn't realised African-American urban musical culture mimicked the structure of corporate America quite so closely) and furthermore they claim he plays chess online. Anyhoo, leaving aside the fact this advert owes more than a little to (read: is a blatant rip-off of) Minority Report, the budget seems to have run a little short of being able to afford actually having the aforementioned CEO appear in the thing. Advertisers ... got to love their creativity. btw: Our video index - thedirectory of all the chess related video clips that have appeared on the S&BCC blog - has receieved a long overdue update. You're lost in a hospital ward, paused at the crossroads between four long corridors, each receeding down toward its own dim middle distance. Which to risk, which to risk? But it's such a busy bustling hospital: someone will come along, you think, soon enough someone will come along & point you in the right direction. So, you wait. Then instead there comes a burst of sun light, and - for a moment - the beam places you in the centre of two perfect squares of light. And just for that second, the scuttling sounds of the wards subside. Silence. You contemplate your sudden new situation like a chess position... The moment passes. Time begins again, the day swirls on... Later you pass the same spot. Again, it's the only spot in the whole hospital still, quiet, empty. Once again, your mind turns to chess. Now, fast forward in time to today. The person who found this place for paused, chess-like contemplation in the hectic hustle of St George's Hospital in Tooting is Sarah Weatherall. She's one of the two Artistic Directors of Lightning Ensemble, "a theatre company and registered charity created in 1995 to develop new writing for theatre," - whose "aim is to bring innovative theatre to a wide and diverse audience in non-traditional theatre spaces." And this moment has gone on to inspire Sarah to create The Chess Players: a chess-based theatre performance in the hospital that will run Thursday 1st, Friday 2nd & Saturday 3rd November of this year. And this is where you might come in. would like to include two or three tables for chess players to play speed chess with patients, visitors and staff at the hospital. The actors will engage with the public and pass them onto the volunteer chess players. We imagine that the volunteer chess players will fill between 1 - 2 hours a day and we welcome anyone who would like to take part in this project. The volunteer chess players will need to interact with the public and should have an interest in working with all levels of chess skill. Lightning Ensemble can meet volunteers prior to the project if they wish to practice on novices or learn more about us face-to-face. Being a chessplayer, I am occasionally a little obsessional in nature. and some of my obsessions are chess ones. Among these, as regular readers will know, is that despite some close calls, I have never beaten an international master, nor drawn with a grandmaster. Hence my interest in Spas Kozhuharov, International Master from Bulgaria. I beat him in July: the best player I've ever beaten and one with a rating remarkably high for an untitled player. Well, at the time he was untitled, or so said his FIDE entry when I looked it up after the game: but he seems to have the title now. So when did he get it? Between then and now, presumably, but when? Last month FIDE listed the titles they had recently approved - and he didn't appear on that list. Which bothered me. Perhaps he had, in fact, already received the title by the time we played, but hadn't been aware of it, or his FIDE entry hadn't been updated? So perhaps I had, in fact, got my maiden win? I hunted round their website for more information but without sucess: I looked up the website of the Bulgarian chess federation. But despite owning an English-Bulgarian phrasebook from 1988 (What are your yields of wheat per hectare? Kakví dóbivi ímate ot zhito na hékat?) I didn't feel up to searching for information that might not even be there, using a keyboard employing the Latin rather than the Cyrillic script. So I wrote to FIDE to ask them. When was the title awarded? And, to the credit of their Elista office, they replied straightaway - though their reply indicates that not everybody is so prompt and well-organised. Please be informed that his application was considered by the 2nd quarter Presidential Board Meeting held in Tallinn, Estonia in June this year and the comment was NO, as the federation did not provide an application form. Later 31 July 2007 after the provision of the requested document the comment was changed to YES and the title was awarded. So there you have it. How close have you come to beating an IM? A missed win, perhaps? An winning endgame misplayed, a win of material overlooked, a good position slipped away in time trouble? Here's how close I've come - a missing application form. A piece of paper. A sodding piece of paper. For pity's sake. I mean, if I'd known, I'd have filled the bloody thing in myself. All of you will be aware that in July last year, Chess lost one of its finest young players in Jessie Gilbert. For us at Coulsdon, the loss of Jessie was a particular blow and not just because of her chess playing ability. Jessie had been with us since the age of 8 and we had watched her grow, not just as a chess player but as a person. As you can imagine, her absence has left a big hole in our club. We have recently agreed with Angela (her Mother) to start what we hope will be an annual open GM norm tournament to be held at Coulsdon in her memory. This will replace our normal medly of all-play-all events for August that have run for the last 3 years (the Christmas and Easter events will continue to run as all-play-alls as previously). The August event has traditionally provided a free entry for an IM norm tournament to the winner of our winter club championship. This year, we are giving 3 international "credits" (£100-£50-£25) which will be used towards this event for the top 3 (anything left over can be used for other events). With Jessie having played in our club championship and also having scored her first WIM norm at CCF, we felt this was a perfect way of linking the club and the international scene to run an annual event that would honour her memory and allow the many chess players whose lives she touched to be a part of. In this regard as well, it is our hope that the event will also raise money for the NSPCC (Childline), a charity which Jessie activly supported during her life. Angela has been working very hard since the loss of her daughter to seek that Jessie's loss should not be in vain and is delighted at the concept of what we are planning. Further details will be available soon on our web site and it is our intention to book at least 6 GM's early and advertise their particiaption. The event will run to finish with the 10th round on the August Bank Holiday each year (just in time for our annual August Blitz event that evening!). In 2008, this means it will start on Saturday 16 August and finish on Monday 25 August. Rounds will begin at lunch time (exact timing tba but probably 1pm). Grand Masters who wish to play are welcome to express interest (please advise what conditions you would be seeking and we will assess accordingly). We hope that the Chess community will come forward and support an event that we hope will run every year, plugging a much needed gap in the British Chess Calendar, as well as supporting a Charity that does a lot of very important work in our community and which was close to Jessie's heart. Further information will be available shortly on the CCF web site. The CCF website is here. My favourite move among moves I've played myself. Or at least, the one that came to mind when asking myself what moves of mine I remembered with most fondness. Looking it up, I was surprised to find how long ago I played it. Indeed, having played no tournament chess - or none at normal time-limits - between 1983 and 1991, it was, it transpired, right at the beginning. The new beginning, when, at the age of 26, I returned to chess. It was played in the third round, against a player then graded 192. So in the sixteen years since, I seem to have done nothing of any note. Or almost nothing. What I like about it, I think, what makes it memorable, is its wit. 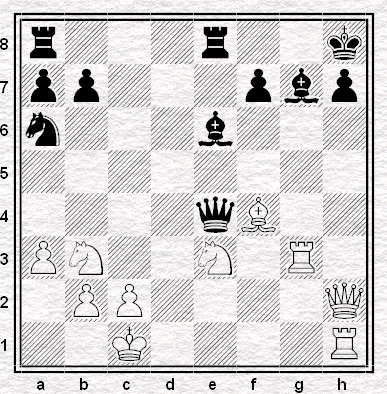 White's previous move was 42.Bf4-e5 attacking my rook on a1 with his dark-squared bishop. How is this best countered? By putting my other rook immediately en prise to his other bishop. It should have won, as well - in fact the game had once already been easily won and then thrown away. (The game is below: you can find the wins yourself, or let the computer do it.) In the sixteen years to come there would be many more easy wins thrown away - some against even stronger opponents - but no moves, it seems, to rank with this one. 1. e4 e6, 2. d4 d5, 3. Nc3 Nf6, 4. e5 Ng8!! 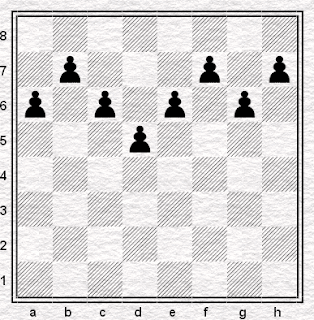 Watson points out the position can also be reached by the even more splendid 1. e4 e6, 2. d4 d5, 3. Nc3 Bb4, 4. e5 Bf8!!!! 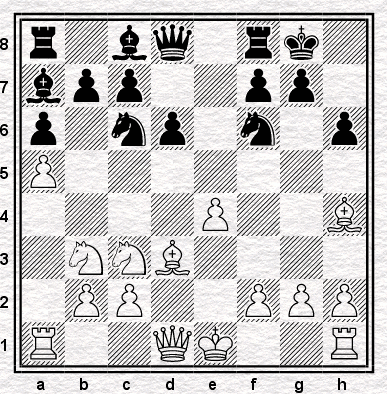 or indeed via Tom's Alekhine move order 1. e4 Nf6, 2. e5 Ng8, 3. d4 d5, 4. Nc3 e6. After 4. 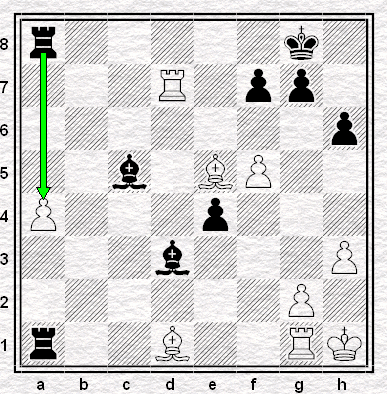 ... Ng8 the sage of all things French considers various lines for White (5. f4, 5. Be3, 5. Nce2, 5. Bd3, 5. Qg4, 5. Nf3 and even the ultra amusing 5. Nb1, which Watson notes transposes into the Advance variation), but who cares about precise variations? Clearly this is an ideal method of dealing with the Haldane Hack - avoiding any nasty tactical tricks Robin might have had in mind by keeping your pieces as far away as possible. Petrosian, as in Tom's post, shows us the way. Only a draw, but even World Champions have off days. "I used to play checkers with her all the time." "You used to play what with her all the time?" "Yeah. She wouldn't move any of her kings. What she'd do, when she'd get a king, she wouldn't move it. She'd just leave it in the back row. She'd get them all lined up in the back row. Then she'd never use them. She just like the way they looked when they were all in the back row." Why, I wonder, do people do this? Why do they deliberately put all their pawns on squares of the same colours? Is it because they can? Is it because they think they're good enough to get away with it? If they're going to do it, why not do it in four moves instead of taking seven? What, indeed, is the quickest time any professional player has taken to get all his or her pawns on the same colour? I dunno. Maybe they just like the way they look. Here is a story with a curious date. It's about how Viswanathan Anand won the world chess championsip. He did this on a Saturday night. The story appeared on Monday morning. a) because BBC Online has no regular chess news, despite covering all other sports in admirable depth? b) because, indeed, somebody was reading the papers on Monday and realised they'd missed something important? c) because they received at least one complaint on the Sunday night about the non-appearance of this story? I'd put my money on a combination of a), b) and c). I'd also put my money on this happening again, and continuing to happen, until the BBC chooses to (or is persuaded to) include regular coverage of chess on its website. Which I've seen described as the best website in the world, a description which - the omission of our game notwithstanding - I think I'd agree with. I've felt for a long time that if there's a crisis in English chess, it's not due to the absence of sponsorship or the ECF or FIDE or any of the other usual easy targets that people like to pick on. It's a crisis of coverage: it is barely in the newspapers, not at all on television and almost wholly absent even from the BBC, with the result that not only is the genuine interest in chess, that already exists, unappreciated, undeveloped and untapped, but no real attempt can be made to develop new interest in the game. To put it as Baudrillard might have put it: chess does not take place. Might - on a psychological level - this move be closer to madness's nextdoor neighbour - that is to genius? After all, the move implies the uncomfortable message from black to white that, I'm not scared about you in the slightest, even if you do have the white pieces. I'm so confident that, in fact, here: have two free turns to improve the initial position, all by yourself. Good luck, you'll need it! Maybe... Or maybe not. Tigran Petrosian was not famous for this kind of thing - accepting an inferior but unusual position in order to disconcert his opponent - instead, his style rested on his defensive talents. 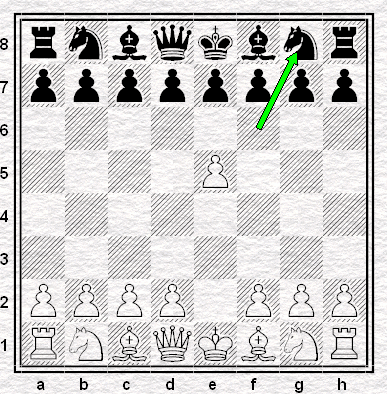 And he played 2...Ng8 in a game from Moscow, 1966, against Isaak Boleslavsky, no less. Petrosian lost, but that had nothing to do with the opening. Perhaps, then 2...Ng8 is more in tune with the old defensive rule, do not create unnecessary weaknesses? But Petrosian played the move once & once only. Others have been more persistent. According to Chess Live, one Maarten D Etmans has played the move 26 times over the last couple of years. Yet despite this expertise & experience, his score is not an entirely convincing +6 =8 -12. Or perhaps I'm missing the point entirely, and the attraction of the move is in fact its flambouyantly suicidal streak. Katrin Daemering's experience might suggest this: having lost two games with the variation in the mid-90s, she finally gave it immediately after scoring her sole victory with it. So what do you think? Does 2...Ng8 tickle your fancy? Many years ago, I recall a certain fuss because a leading Russian player and psychologist, Nikolai Krogius, perhaps over-reliant on Freud, had written a book, Chess Psychology, which suggested that part of the motivation involved in attacking and checkmating the king related to a desire to kill our fathers. I had forgotten about this until I happened, over the weekend, to receive a free copy of the June 2007 edition of Chess magazine, in which the first part of a series on Owen Hindle had appeared, in which David LeMoir traced the early professional career of the Norfolk-based FIDE Master. The move Hindle played was 1.Nc6! 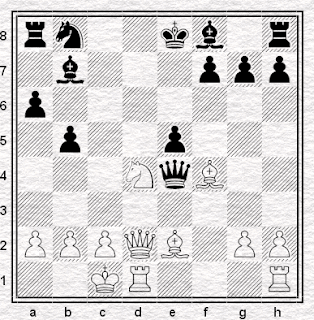 (1.Nf5 also wins in similar fashion). As well as the game continuation (1...Be7 2.Qd8+ resigns) LeMoir gives two variations: 1...Nxc6 2.Qd7 # and 1...f6 Qd8+ Kf7 3.Rd7+ Nxd7 4.Qxd7+ Kg6 (if 4...Kg8 5.Qe6 #) 5.Nxe5+ fxe6 6.Qe6#. Oddly he omits the line which I'd guess Black was relying on: 1...Qxf4 (apparently pinning the queen) 2.Qxf4 exf4 3.Rd8#. A nice finish which must have given the young Hindle no end of satisfaction. It gave me no end of satisfaction either, when I saw the magazine on Saturday. His opponent, ARG Horton, is my father. I'm playing a correspondence game against an English player, John Townsend, who takes an interest in chess history and particularly in Howard Staunton. I spotted John's name in Edward Winter's column and when I mentioned this to him, he showed me his website. As I could see he was asking for assistance with certain questions, I asked if he would like me to post about it here. 2. He was interested in the theatre (later in life he was a noted Shakespearean scholar) and claimed to have taken the part of Lorenzo in The Merchant of Venice. Where and when was this performance and what was his stage name? 3. Can he be located on the 1841 census? Obviously these are questions that would demand a substantial degree of specialist historical knowledge in order to answer them - indeed, to know where to look in the first place - but it is possible that among our readers there are people who possess such knowledge or are acquainted with others who may do so. Anyway, there is an email address on John's site where people may contact him (or replies can of course be posted here) and if anybody is able to help it would surely be appreciated. Why not sacrifice? - if it is correct. But bridges I don't burn, it's not my speciality. The new FIDE grades are out and I am at my highest ever, hurrah*! 2157, the website tells me, with a dinky little chart showing my progress over the past three years. Well, I'm 42 now and the decline has to set in before too long, but just for the moment, it's up and up. Very impressive - if you both know what it means and ignore the fact that there are players graded more than 600 points above that figure, an unlikely combination. If you understand what it means, you understand that it's good but not that good. Less impressive, too, if you want to impress your friends, since they are highly unlikely to know - or indeed care - what an Elo rating is or what sort of strength it signifies. If I could say "I'm a grandmaster" it might impress them. That's what I like about that term, it doesn't just sound good, it sounds better the less you know about it. Like the holder of the title is Gandalf or something. But as I'm yet to manage so much as a draw against a grandmaster I can't even say I've beaten one, ever. Anyway, the point is that you can give people a far better picture of your relative strength by referring to your ranking. How many people in the country are better than you are? There used to be a function on the FIDE website allowing you to do this - last time I used it, probably with the April list, I was ranked 290 among English players, which either impresses people or does not, but does at least tell them something that an Elo number doesn't. I must be a little higher than that now. But how much, I don't know, since I can't find the function on the website any more. Is it still there and I just can't find it, or has it gone? If it has, that's a shame. Of late we've had a couple of posts that have touched on the subject of the number of quick draws in Mexico 07 (see here and here). Which doesn't sound too bad does it? I wondered whether the 100 move draw that was Leko-Gelfand from round 3 affected the figures unduly. As it turns out, though, the median* is 40 and even if we ignore Leko-Gelfand altogether the average still comes out at 38.35. Perhaps there weren't so many short games afterall? Now let's move on to another kind of quick finish. Had the World Championship tournament finished in a tie then this time a week ago, the title would have been settled with a series of rapid play games. ... but my inner chess nerd (never far from the surface) demands to know, "Why not just Qf7mate?" Following on from yesterday, some more numbers from the world championship. 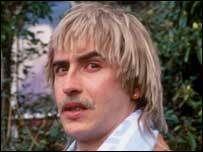 I'm coming to London at the start of October, to play some chess, get away from work, do some drinking and generally skive around for a while. Naturally I will not be alone in this since thousands of students will be doing much the same. I shall be playing the Metropolitan Chess Congress: they, however, lured by the Big City, the promise of free internet access provided by someone other than their parents and the opportunity to run up phenomenal debts that will cripple them financially for twenty or thirty years to come, will be here for slightly longer than an extended weekend. Assuming that some at least of these may be readers of this column, perhaps I might use the opportunity to invite them to play for the most famous, the most friendly and unquestionably the best club in London. New members are always welcome: they're offered competitive chess in three different leagues. Though the clubroom is in Streatham, league games are played at a variety of central (and some not-so-central) venues. All sorts of standards are catered for. There are contact details here. So why play for anybody else? Everybody welcome (students and non-students alike). We look forward to hearing from you. So Anand is the new World Champion - and if you don't believe me you can see the very moment it happened on this video published on the ICC. 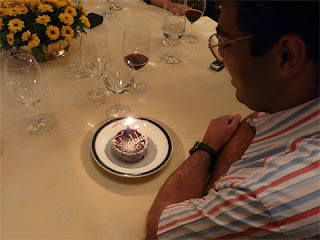 "I'm world champion now, bring me a F***ING BIGGER CAKE"
Anand is unlikely to have said. ... while at the bottom of their report on the last round there's a few minutes of the new champ being interviewed on video. In amongst the mundane verbiage you'd expect to be on display in such situations there's also Anand giving a somewhat less than unequivocal "bring it on" response to a question about next year's duel with Kramnik. I do hope that's not going to be the start of a campaign to get out of the match. Anand, the fawning interviewer and anybody else for that matter, can bang on about the title be regained or won for a second time but in truth it was only on Saturday night that Anand became world champion. He took the title from Kramnik who won it from Kasparov and so on back to Steinitz. Let's be clear, Anand is the World Champion and number one rated player in the world but if he fails to beat Kramnik in a match, the traditional format for deciding such matters, the legitimacy of his claim to be the 15th Champion will be compromised. For now, though, Anand is undisputed King. ... but what of the others? What of, say, Morozevich? If Kramnik is brave Sir Robin (and in the video above I fondly imagine the minstrel with the tambourine to be Loek van Wely) who might Moro be? Morozovich was up for a scrap throughout Mexico 07 and was involved in more decisive games (eight) than anybody else. Full of fighting spirit, he never gave up but try as he might, he had an unfortunate tendency to come off second best ... a bit like the Black Knight really.